For other uses of "Whittlesey", see Whittlesey (disambiguation). 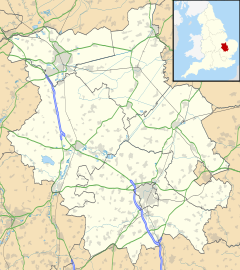 Whittlesey is an English city 6 miles (10 km) east of Peterborough in the Fenland district of Cambridgeshire. Including the neighbouring villages of Coates, Eastrea, Pondersbridge and Turves, it had a population of 16,058 at the 2011 Census. The town is still left without a bridge over the local rail crossings, which continues to infuriate locals. Whittlesey appears in the Cartularium Saxonicum (973 A.D.) as 'Witlesig', in the Domesday Book as 'Witesie', and in the Inquisitio Eliensis (1086 A.D.) as 'Wittleseia'. The meaning is "Wit(t)el's island", deriving from either Witil, "the name of a moneyer", or a diminutive of Witta, a personal name; + "eg", meaning "'island', also used of a piece of firm land in a fen." Before the draining of the fens, Whittlesey was an island of dry ground surrounded by the marshy fens. Excavations of nearby Flag Fen indicate thriving local settlements as far back as 1000 BC. At Must Farm quarry, a Bronze Age settlement is described as "Britain's Pompeii" due to its relatively good condition. In 2016 it was being excavated by the University of Cambridge's Cambridge Archaeological Unit. At Must Farm at least five homes of 3,000 years in age have been found, along with Britain's most complete prehistoric wooden wheel, dating back to the late Bronze Age. In more recent times[when?] Whittlesey was linked to Peterborough in the west and March in the east by the Roman Fen Causeway, probably built in the 1st century AD. Roman artefacts have been recovered at nearby Eldernell, and a Roman skeleton was discovered in the nearby village of Eastrea during construction of its village hall in 2010. The town's two parishes of St Mary's and St Andrew's were controlled by the abbeys in Thorney and Ely respectively until the Dissolution of the Monasteries (c. 1540). The two parishes were combined for administrative purposes by the Whittlesey Improvement Act of 1849. Despite the proximity of Peterborough, Whittlesey is in the Diocese of Ely. Whittlesey was significant for its brickyards, around which the former hamlet of King's Dyke was based for much of the 20th century, although only one now remains, following the closure of the Saxon brickworks in 2011. The local clay soil was also used to make cob boundary walls during a period in which there was a brick tax. Some examples of these roofed walls still stand today and are claimed to be unique in Fenland. Clay walls predate the introduction of brick tax in other parts of the country, and some were thatched. Whittlesey had a large number of public houses. In 1797, a local farmer noted in his diary "they like drinking better than fighting in Whittlesea." Whittlesey was an important trade route in the late Bronze Age (about 1100–800 BC). Evidence for this was found at the archaeological site of Must Farm, where log boats, roundhouses, bowls with food in them, and the most complete wooden wheel were housed. St Mary's Church is 15th century, but the majority of the building is later. The church has one of the largest buttressed spires in Cambridgeshire. It also contains a chapel which was restored in 1862 as a memorial to Sir Harry Smith. St Andrew's Church is a mixture of the Perpendicular and Decorated styles of Gothic, and has records back to 1635. The Market Place is the site of the town's market, held every Friday. A right to hold a weekly market was first granted in 1715, although there have been several periods since then during which the market did not function, for example from the late 1700s until about 1850. In the centre of the Market Place is the Buttercross, dating back to 1680. Originally a place for people to sell goods at market, the structure was considered useless in the 1800s and was only saved from demolition when a local businessman donated some slate tiles for the roof. It served as a bus shelter, until the relocation of bus services from the Market Place to a purpose-built terminal in Grosvenor Road. Whittlesey is between Peterborough, 6 miles (10 km) to the west, and March, 11 miles (18 km) to the east, and is bordered to the north by the River Nene and to the south by Whittlesey Dyke. Historically it was connected to Peterborough and March by the Roman road Fen Causeway constructed in the first century AD, a route approximately followed by the modern A605. Whittlesea railway station, using the town name's older spelling, is on the Ely to Peterborough Line, with direct trains to Cambridge, Birmingham, Liverpool, Leicester, Stansted Airport, Ely, Ipswich and Peterborough. The Whittlesey Summer Festival, held annually in September, takes over much of the town centre. Attractions in recent years have included a classic car display, an Italian food stall, fairground rides, a steam engine, and in 2009, a flying display by a Hawker Hurricane of the Battle of Britain Memorial Flight. An art competition, for students of Sir Harry Smith Community College also runs with the festival, with entries displayed throughout the day in the Whittlesey Christian Church. At the 2009 festival people of Whittlesey raised £10,000 for bushfire victims in Whittlesea, Melbourne. From 2011 to 2015 there was a planning battle between rival supermarket chains Tesco and Sainsbury's, which competed to build on neighbouring sites in Eastrea Road. Dubbed "Supermarket Gate" by the local press, the dispute was eventually resolved when Sainsbury's won approval for its supermarket, business park and country park development in June 2015. Plans for over 400 houses on an adjacent site, construction of which began in late 2014, generated controversy when approved, because of concerns about the additional traffic generated on the A605. Close to the King's Dyke brickworks are three 80-metre wind turbines, the largest on-shore turbines in England, which power the McCains chips plant. Whittlesey Museum, in the Old Town Hall, has collections on the natural and cultural heritage of Whittlesey and the surrounding area. On Plough Tuesday, the day after the first Monday after Twelfth Night, a man or a boy would be covered from head to foot in straw and led from house to house where he would dance in exchange for gifts of money, food or beer. The festival was of a stature that farmers would often reserve their best straw making the bear. The custom died out in about 1909, probably because the local police regarded it as begging, but it was resurrected by the Whittlesea Society in 1980. The festival has now expanded to cover the whole weekend when the Bear appears not on Plough Tuesday but the second weekend in January. On the Saturday of the festival, the Bear progresses around the streets with its attendant "keeper" and musicians, followed by traditional dance sides (mostly visitors), including morris men and women, molly dancers, rappers and longsword dancers, clog dancers, who perform at points along the route. The Bear dances to a tune (reminiscent of the hymn "Jesus Bids us Shine") which featured on Rattlebone and Ploughjack, a 1976 LP by Ashley Hutchings, along with a spoken description of the original custom that had partly inspired the Whittlesey revival. "Sessions" of traditional music take place in public houses during the day and evening, and a barn dance or ceilidh, and a Cajun dance end the Saturday night. The bear "costume" is burned at a ceremony on Sunday lunchtime, (just as, in Germany, the Shrovetide bear costumes are also ceremonially burned after use). The Whittlesea Straw Bear and Keeper are pictured in the album art of The Young Knives' album, Voices of Animals and Men. The town has one secondary school, Sir Harry Smith Community College, which opened in 1953 on the site of Whittlesey Workhouse, and three primary schools. There is another primary school in the neighbouring village of Coates. Sir Harry George Waklyn Smith (1788–1860), best known for his role in the Battle of Aliwal (India), was born in Whittlesey. His military career saw him rise from a rifleman to a major general and Baronet of Aliwal. He was governor of the Cape of Good Hope from 1847 to 1852, during a period of intense unrest. Smith featured in Rifles by Mark Urban, about the 95th Rifles Napoleonic campaigns through Spain to Waterloo, during which time he was a junior officer and served with his two brothers. He is commemorated through the Whittlesey area, giving his name to the Sir Harry Smith Community College and community centre, for example. There is a bust of him in St Mary's Church. There is a pub named The Hero of Aliwal and a street named Aliwal Road in his honour. The house where he was born bears a plaque with his name. At the time of his death, the building was used as a school, but at present it is a private house. He is buried in the local cemetery. L. P. Hartley CBE (1895–1972): English author Leslie Poles Hartley was born on 30 December 1895 in Whittlesey. His best known novels are the Eustace and Hilda trilogy and The Go-Between. John Clare's poem "The Shepherds Calendar", mentions Whittlesea in the verse for January. ^ "2011 Census Profile - Whittlesey Parish eb site". ^ Ekwall, Eilert (1960). The Concise Oxford Dictionary of English Place-Names (4th ed.). Oxford University Press. ^ "Bronze Age houses uncovered in Cambridgeshire are Britain's 'Pompeii'". BBC Online. 12 January 2016. Retrieved 12 January 2016. ^ "Must Farm". Retrieved 12 January 2016. ^ "Must Farm". Mustfarm.com. Retrieved 14 February 2019. ^ Papworth, Andrew (20 August 2010). "Could this be Whittlesey's earliest known resident?". Cambs Times. ^ The Journeys of Celia Fiennes. Edited and introduced by Christopher Morris (London: The Cresset Press, 1949), p. 67. ^ "Mudwall leaflet" (PDF). www.whittleseymuseumcollections.com. Retrieved 15 January 2019. ^ "Thatched walls". www.thatching.com. Retrieved 15 January 2019. ^ Millennium Memories of Whittlesey – a series of books on Whittlesey history. Published on behalf of the Whittlesey Museum. ^ R B Pugh, ed. (2002). "North Witchford Hundred – Whittlesey". A History of the County of Cambridge and the Isle of Ely: Volume 4: City of Ely; Ely, N. and S. Witchford and Wisbech Hundreds. pp. 123–135. ^ "Whittlesey, St Mary". Cambridgeshire Churches website. Druidic.org. Retrieved 6 September 2010. ^ "Whittlesey, St Andrew's". Cambridgeshire Churches website. Druidic.org. Retrieved 6 September 2010. ^ a b R B Pugh, ed. (2002). "North Witchford Hundred - Whittlesey". A History of the County of Cambridge and the Isle of Ely: Volume 4: City of Ely; Ely, N. and S. Witchford and Wisbech Hundreds. British History Online (online version). ^ "Families flock to Whittlesey Summer Festival". Peterborough Today. 16 September 2009. Retrieved 6 September 2010. ^ "Derek Stebbing is new Mayor of Whittlesey". Peterborough Today. 20 May 2009. Retrieved 6 September 2010. ^ "McCain introduces winds of change to UK's largest chip factory" (press-release). Mccain.co.uk. 14 August 2007. Retrieved 6 September 2010. ^ Hole, Christina (1978). A Dictionary of British Folk Customs. Paladin. p. 286. ISBN 0-586-08293-X. ^ "FG "Fideler Aff" e.V. Walldürn". Fideler-aff.de. Retrieved 6 September 2010. ^ "Stadt Walldürn - Kraft schöpfen im Odenwald | Ahoi und Helau - Faschenaacht bei den Affen, Dundern und Höhgöikern". Wallduern.de. 2 January 2006. Retrieved 6 September 2010. ^ 16_-_05.02.08. "16_-_05.02.08 | ja album |Image 7 of 20". Helau-ocv.de. Archived from the original on 19 February 2011. Retrieved 6 September 2010. ^ Fraser, Sir James George (1963). The Golden Bough, A Study in Magic and Religion (Abridged Edition). Macmillan. p. 306. ^ "Straw Bear Festival website – Procession". Strawbear.org.uk. Archived from the original on 26 December 2008. Retrieved 6 September 2010. ^ "Straw Bear Festival website – Burning". Strawbear.org.uk. Archived from the original on 26 December 2008. Retrieved 6 September 2010. ^ 30_-_20.02.07. "30_-_20.02.07 | ja album |Image 21 of 27". Helau-ocv.de. Archived from the original on 19 February 2011. Retrieved 6 September 2010. ^ Higginbotham, Peter. "The Workhouse in Whittlesey, Cambridge". www.workhouses.org.uk. Retrieved 6 September 2010. ^ "books". independent.co.uk. Retrieved 14 February 2019. ^ "The "David Proud Suite" at Sir Harry's". Davidproud.co.uk. 28 April 2010. Retrieved 6 September 2010.